Until recently, promoted as the most luxurious hair oils. Kerastase Elixir Ultime products are the must-have in many hair salons. The original version is a versatile beautifying oil for all hair types. It nourishes the hair, delivers silky smoothness, radiance and protection. It also increases the resistance to damaging external factors. … were supposed to be complex. In reality, Kerastase Elixir Ultime works mainly on the surface of the hair. It boosts shine and delivers velvety softness thanks to many silicones. At the same time, it protects from the action of external factors, including the sunlight and toxins. The smoothed hair surface is not only full of shine but also nourished and moisturised. Kerastase Elixir Ultime Oléo-Complexe facilitates styling and brushing. It can reduce frizz. That’s all. … is going to surprise you… in a negative way. Although it offers four natural and quite exotic oils, there are lots of unnatural substances. The main ingredients are silicones. Regrettably, not the safe ones that you cannot easily wash out. There are also fragrances listed among potential allergens and a strongly dehydrating alcohol. Kerastase Elixir Ultime has nothing to be proud of. … has a golden, quite thick formula. It is easily distributed on hair but takes time to absorb. It can leave a greasy layer and weigh the hair down. That is why, it won’t work for fine hair. 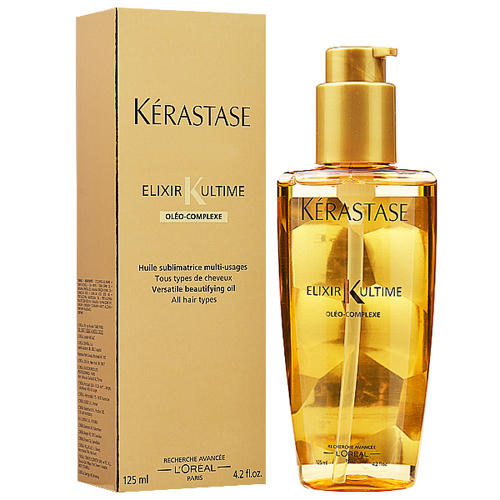 If you apply too much Kérastase Elixir Ultime, it can intensify greasy hair and be hard to wash off. … will be appreciated by women who like products to have a variety of uses. Elixir Ultime can be applied in three ways: applied to damp hair before styling for easy combing; applied to dry hair after styling for shine; used in daily care to protect, nourish and smooth the hair. Kerastase Elixir Ultime is unsuitable for scalp care. … is really presentable. It was made with attention to detail. The thick glass secures the liquid. The shape of the bottle is very handy no matter if you have a 100 ml or 50 ml (less popular) version. The precise pump (measuring out ideal portions) and fancy golden design are the strong sides of the product. This multitasking Davines Authentic Nourishing Oil has superb nourishing and moisturising properties. The Magnificent Eight Copyright © 2019.